Leather Big Book Covers, Custom Hand Made by “Book Cover” Bob. 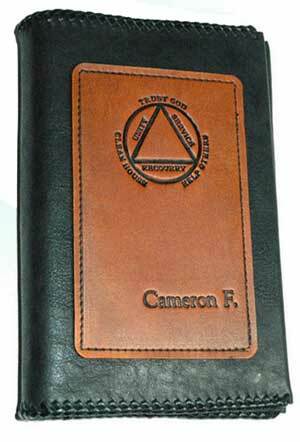 Basic and Custom made-to-order Alcoholics Anonymous Leather Big Book Covers for your Big Book. All covers are handmade from various types of leather. Most are laced with vegetable tanned cow hide in black, brown or natural. These leathers are not the “thin” leathers found in commercially produced covers. The cover is of a “slip-on” design, much like the old way we used to cover our school books with cut up paper grocery bags. Most of the covers are chrome tanned cow hide in many colors. To view some samples of the Basic Leather Big Book cover visit “Book Cover” Bob at at: http://www.leatherbigbookcovers.com. The inventory changes quite often and some colors are available immediately, others would have to be special ordered. Samples shown are all chrome tanned leather and are either suede, smooth or embossed finishes. Bob chooses what he think are interesting, popular textures and colors.